Insiders Guide through the "Temple of the Greates"
A remarkably well-known piece of art by the famous artist, Agnolo Bronzino, Descent of Christ into Hell, created in 1552, hangs gloriously, in the church of Santa Croce in Florence, Italy. And the painting is quite the charmer. I sat completely immersed in the colors, figures and size. It is 597 by 567 centimeters. 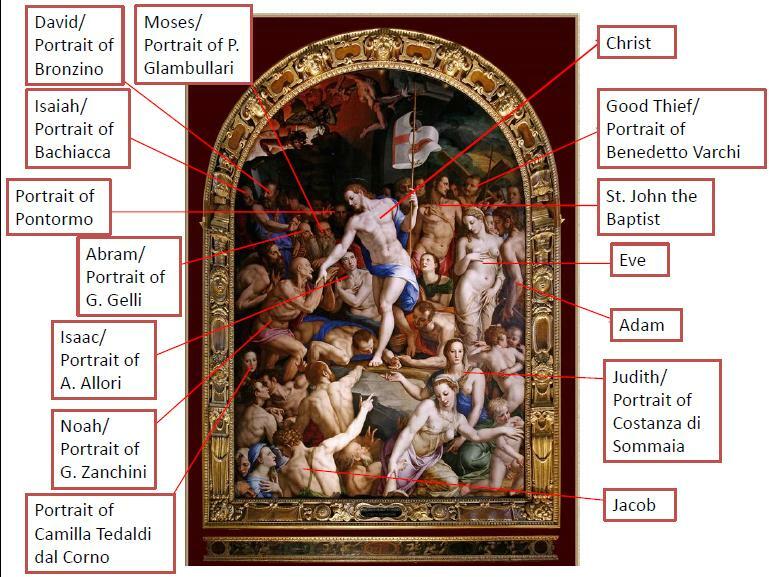 The painting has an original gilded wood frame, designed by Bronzino himself, with a depiction of altar steps and scrolls showing the supper at Emmaus, St. Thomas and Pentecost, and the cardinal virtues. The painting and its frame were meticulously restored following the terrible flood of 1966. The restoration took no less than 40 years! No one needs to be an art history enthusiast to be captured by the breath of the oil painting’s fluidity. In the center of the painting stands Jesus – tall, slender and muscular, pale with light-brown hair reaching out to hold a bald man’s boney hand, which we find out is Noah. If you look to the back of the piece Abraham and Isah are standing together sporting matching beards and the patron Saint of the Firenze, John the Baptist, is the man to the upper right who is scantily clothed, looking away from Christ. There is one other figure who is prominently shown, basking in some of the illuminated light painted on Jesus. It is Eve, with Adam next to her. The biblical character Jacob bears a green cloth in the lower left of the piece. How did I, a Communications and Rhetoric major, come to magically know the significance of the adoring faces creating a bodily frame around Jesus? Read on. Art is wonderful to look at but to know the inside story of the work makes it all the more rewarding. Here is where the marvels of technology come in handy – when an exhibit focusing on Bronzino, a Medici court artist, was held at the Palazzo Strozzi, a lovely, dummy-proof electronic board was created, allowing visitors to “meet” the Saints and Old Testament figures depicted. Thanks to this technology, you can now simply put names to faces. It brings you closer to the painting, closer to its meaning. The electronic board also reveals important information regarding the restoration of the painting. A touchscreen button allows you to see the painting as it was after the water damage. The painting looked choppy, colors bleeding into others, confusing. A viewer would have only seen subdued colors and outlines of the larger images. But with a gentle swipe of your hand over the glass board, you can instantly see the changes that happen underneath your palm. The heat sensitive screen allows you to finger-paint over the ruined image to see the work of the restoration. For me, it was brilliant. The painting came alive with the colors, the lines and the shapes. Before, the bodies looked alien-like; but after, you see the defined muscles and bright hued colors. Each body wears a cloth of magnificent blues, pinks, reds and greens. After the restoration, they became ever more purposeful, and Bronzino’s attention to space is recognized. If Santa Croce had not restored this masterpiece, the painting would have lost some of its most special aspects. 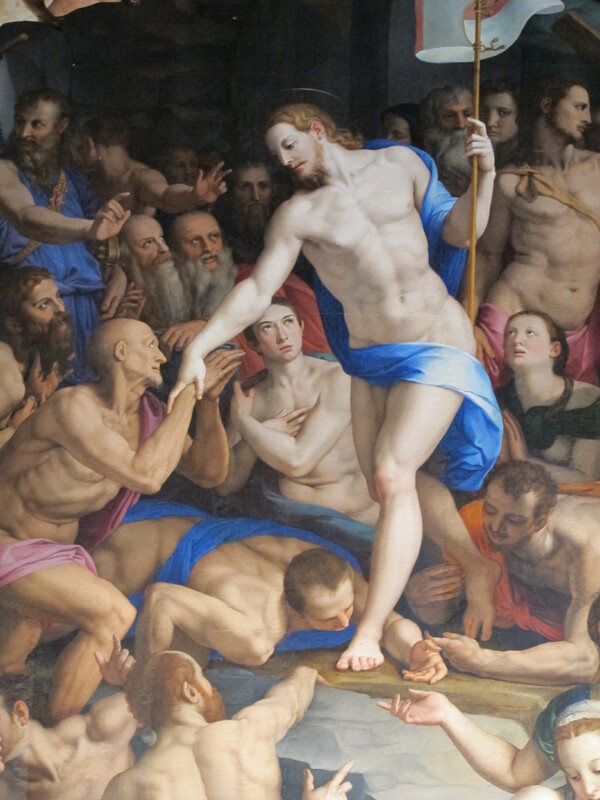 Without the restoration, Bronzino’s portrayal of the story of Christ descending to limbo would have been lost in the damages the water caused. Bronzino’s masterpiece, can soon be admired in its new home”- the Medici Chapel of the Novices in Santa Croce. The new itinerary of the church will be inaugurated on May 3rd, 2014 in commemoration of 720th anniversary of the foundation of the church of Santa Croce in Florence. Blogger Caroline Koller is Communications and Rhetoric major at Syracuse University in NY, currently doing her study abroad semester at Syracuse University in Florence.